To date, there has been no comprehensive assessment of the economic risks our nation faces from the changing climate. Risky Business: The Economic Risks of Climate Change to the United States uses a standard risk-assessment approach to determine the range of potential consequences for each region of the U.S.—as well as for selected sectors of the economy—if we continue on our current path. The Risky Business research focused on the clearest and most economically significant of these risks: Damage to coastal property and infrastructure from rising sea levels and increased storm surge, climate-driven changes in agricultural production and energy demand, and the impact of higher temperatures on labor productivity and public health. If we continue on our current path, by 2050 between $66 billion and $106 billion worth of existing coastal property will likely be below sea level nationwide, with $238 billion to $507 billion worth of property below sea level by 2100. There is a 1-in-20 chance—about the same chance as an American developing colon cancer; twice as likely as an American developing melanoma2—that by the end of this century, more than $701 billion worth of existing coastal property will be below mean sea levels, with more than $730 billion of additional property at risk during high tide. By the same measure of probability, average annual losses from hurricanes and other coastal storms along the Eastern Seaboard and the Gulf of Mexico will grow by more than $42 billion due to sea level rise alone. Potential changes in hurricane activity could raise this figure to $108 billion. Property losses from sea level rise are concentrated in specific regions of the U.S., especially on the Southeast and Atlantic coasts, where the rise is higher and the losses far greater than the national average. As with sea level rise, these national averages mask regional extremes, especially in the Southwest, Southeast, and upper Midwest, which will likely see several months of 95°F days each year. Over the longer term, during portions of the year, extreme heat could surpass the threshold at which the human body can no longer maintain a normal core temperature without air conditioning, which we measure using a “Humid Heat Stroke Index” (HHSI). During these periods, anyone whose job requires them to work outdoors, as well as anyone lacking access to air conditioning, will face severe health risks and potential death. As extreme heat spreads across the middle of the country by the end of the century, some states in the Southeast, lower Great Plains, and Midwest risk up to a 50% to 70% loss in average annual crop yields (corn, soy, cotton, and wheat), absent agricultural adaptation. We also know that the private sector does not operate in a vacuum, and that the economy runs most smoothly when government sets a consistent policy and a regulatory framework within which business has the freedom to operate. Right now, cities and businesses are scrambling to adapt to a changing climate without suffcient federal government support, resulting in a virtual “unfunded mandate by omission” to deal with climate at the local level.4 We believe that American businesses should play an active role in helping the public sector determine how best to react to the risks and costs posed by climate change, and how to set the rules that move the country forward in a new, more sustainable direction. This is only a first step, but it’s a step toward getting America on a new path leading to a more secure, more certain economic future. Americans understand risk. Our ability to evaluate risk—to take calculated plunges into new ventures and economic directions and to innovate constantly to bring down those risks—has contributed immensely to the nation’s preeminence in the global economy. From the private sector’s pioneering venture-capital financing model to the government’s willingness to invest in early-stage inventions like the computer chip or the solar panel, our nation’s ability to identify and manage potential risks has moved the economy forward in exciting and profitable directions. The Risky Business Project is designed to apply risk assessment to the critical issue of climate change, and to take a sober, fact-based look at the potential risks facing specific sectors and regions of the national economy. As in a classic business risk assessment, we analyzed not only the most likely scenarios, but also the scenarios that, while less likely, could have more significant impacts. Our conclusion: The American economy faces multiple and significant risks from climate change. Climate conditions vary dramatically across the U.S., as does the mix of economic activity. Those variations will benefit our economic resilience to future climatic changes. But each region of the country has a different risk profile and a different ability to manage that risk. There is no single top-line number that represents the cost of climate change to the American economy as a whole: We must take a regional approach to fully understand our climate risk. Given the range and extent of the climate risks the American economy faces, it is clear that staying on our current path will only increase our exposure. The U.S. climate is paying the price today for business decisions made many years ago, especially through increased coastal storm damage and more extreme heat in parts of the country. Every year that goes by without a comprehensive public and private sector response to climate change is a year that locks in future climate events that will have a far more devastating effect on our local, regional, and national economies. Moreover, both government and the private sector are making investment decisions today—whether in property, long-term infrastructure or regional and national supply chains—that will be directly affected by climate change in decades to come. Our assessment finds that, if we act now, the U.S. can still avoid most of the worst impacts and significantly reduce the odds of costly climate outcomes—but only if we start changing our business and public policy practices today. The Risky Business Project does not dictate the solutions to climate change; while we fully believe the U.S. can respond to these risks through climate preparedness and mitigation, we do not argue for a specific set or combination of these policies. Rather, we document the risks and leave it to decision-makers in the business and policy communities to determine their own tolerance for, and specific reactions to, those risks. Assessing and managing risk is how businesses, militaries, and governments are able to remain productive and successful in an increasingly complex, volatile, and unpredictable global economy. The Risky Business assessment evaluates a range of economic risks presented by climate change in the U.S., including both those outcomes considered most likely to occur and lower probability climate futures that would be either considerably better or considerably worse than the likely range. This is a common risk assessment approach in other areas with potentially catastrophic outcomes, including disaster management, public health, defense planning, and terrorism prevention. In presenting our results we use the term “likely” to describe outcomes with at least a 67% (or 2-in-3) chance of occurring. In discussing tail risks, we generally describe results as having a 1-in-20 chance (or 5%) of being worse than (or better than) a particular threshold. Where the science allows it, we also describe 1-in-100 outcomes, or those with a 1% chance of occurring. The risk approach is well suited to the issue of climate change. Even the single term “climate change” is shorthand for a diverse array of impacts, mostly stemming from increased heat in the atmosphere and oceans, but also radiating outward in myriad and geographically diverse ways. For example, in some regions sea levels will likely rise, while in others they may actually fall. In some areas we will likely see increased droughts, whereas in others the combination of heat and humidity could lead to physically unbearable outdoor conditions, with increased risk of heat stroke for the many Americans who work outdoors in sectors such as construction, utility maintenance, transportation, and agriculture. Figure 1. Our research examines the risks of the U.S. continuing on its current path, or “business as usual.” Alternate pathways that include investments in adaptation or policy efforts to mitigate climate change through lowering carbon emissions could significantly reduce these risks. The Risky Business Project examines the risks of the U.S. continuing on its current path, or “business as usual.” This assumes no new national policy or global action to mitigate climate change and an absence of investments aimed at improving our resilience to future climate impacts. 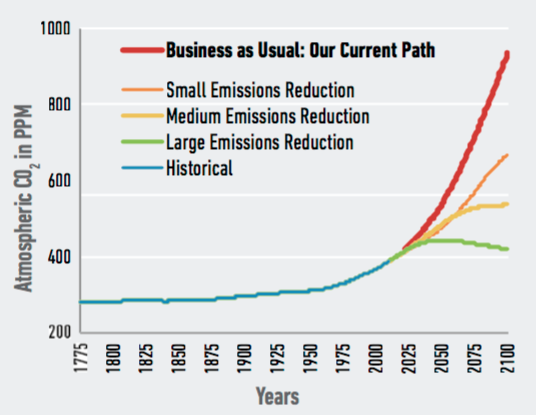 Taking these policy and adaptive actions could significantly reduce the risks we face, as illustrated in Figure 1. Figure 2. Human society is structured around “normal” weather, with some days hotter than average and some colder. At the distant “tails” are extreme events such as catastrophic weather. Climate change shifts the entire distribution curve to the right. Old extremes become the new normal, new extremes emerge, and the process continues until we take action. Our research analyzes the risks of “business as usual” to specific critical sectors of the economy and regions of the country. We focus in particular on sectors that are already making large, expensive investments in infrastructure that will likely last well into the future: agriculture, energy, and coastal infrastructure. We also look at the impact of climate change on America’s labor productivity and public health, which influence multiple economic sectors. These latter impacts also are deeply connected to our shared future quality of life. As with any risk assessment, our investigation looks at not only the most likely outcomes, but also climate futures that have a lower probability of occurring but particularly severe consequences should they come to pass. (See “Defining Risk”) This focus on “tail risks” is not unique to climate change. After all, households and businesses pay a premium for insurance to protect themselves against those tail risks, such as the possibility of flood or fire, that they deem unacceptable. The military plans for a wide range of possible (and sometimes highly unlikely) conflict scenarios, and public health officials prepare for pandemics of low or unknown probability. Our risk assessment begins with the straightforward fact that human-induced climate change leads to rising temperatures. If we continue along our current path, with no significant efforts to curb climate change, the U.S. will likely see significantly more days above 95°F each year. By the middle of this century, the average American will likely see 27 to 50 days over 95°F each year—from double to more than triple the average number of 95°F days we’ve seen over the past 30 to 40 years. Climate change impacts only accelerate with time, so that by the end of this century we will likely see 45 to 96 days per year over 95°F. That’s between one and a half and three months of the year at what are now considered record hot temperatures. To put this in context, by the end of the century, Oregon, Washington, and Idaho could well have more days above 95°F each year than there are currently in Texas. These are only the most likely scenarios; there are possible lower and higher estimates outside the most likely range. Within that range, there are also disparities, of course: As the maps that follow demonstrate, some regions of the country will be far harder hit by extreme heat than others, and some will experience rising temperatures in terms of warmer winters rather than unbearable summers. What matters isn’t just the heat, it’s the humidity—or, in this case, a dangerous combination of the two. One of the most striking findings in our analysis is that increasing heat and humidity in some parts of the country could lead to outside conditions that are literally unbearable to humans, who must maintain a skin temperature below 95°F in order to effectively cool down and avoid fatal heat stroke. The U.S. has never yet seen a day exceeding this threshold on what we call the “Humid Heat Stroke Index,” but if we continue on our current climate path, this will change, with residents in the continental U.S. experiencing 1 such day a year on average by century’s end and nearly 17 such days per year by the end of next century. Figure 3: Average Days Over 95°F: Projections Mapped Over a Lifetime. On our current path, the U.S. will likely see significantly more days above 95°F each year. Some regions of the country will be hit far harder by extreme heat than others, and some will experience rising temperatures in terms of warmer winters rather than unbearable summers. But by the end of this century, the average American will likely see 45 to 96 days per year over 95°F. A warmer atmosphere makes extreme precipitation more likely, which is expected to make wet regions even wetter, but could also make dry regions even drier. Because the U.S. is such a large and geographically diverse country, it will experience every one of these climate impacts in the next century. Even the individual sectors we studied have regional variations: For agriculture, for instance, the national story is one of an industry able to adapt by changing where and what farmers plant; at the same time, the story within particular regions is quite different, as individual farmers potentially abandon traditional crops or move away from the farming business altogether. For the energy industry, the story in the warming North is starkly different than in the increasingly unbearably hot South. Sea levels, too, vary significantly across the U.S., and even across cities along the same coastline: For example, sea level rise at New York will likely be higher than at Boston, and sea level rise at San Diego will likely be higher than at San Francisco. Rising temperatures will also reduce labor productivity, as some regions—especially the Southeast and Southwest—become too hot by mid-century for people to work outside during parts of the day. Heat will also put strains on our energy system, simultaneously decreasing system efficiency and performance as system operators struggle to cool down facilities, and increasing electricity consumption and costs due to a surge in demand for air conditioning. As parts of the nation heat up, the worst health impacts will be felt among the poor—many of whom work or even live outdoors or can’t afford air conditioning at home—and among those too elderly or frail to physically withstand the heat or get themselves to air-conditioned facilities. More than any other factor, our direct economic exposure to climate change will be determined by where we do business. For that reason, we present our findings below in terms of the major regions of the U.S., and then identify how climate change will affect critical sectors within those regions. Still, as any business person knows, these impacts won’t be contained within regional boundaries; the ripple effects are likely to resonate throughout the economy. Put another way, just because it’s not hot where you are doesn’t mean you won’t feel the heat of climate change. The Risky Business analysis builds on the research and analytical work done over the past several decades by international climate scientists and economists, including the recent National Climate Assessment (NCA), released in early May 2014. The Risky Business Project takes as our unit of measurement the National Climate Assessment regions, which are organized loosely around shared geologic characteristics and climate impacts.10 These are: Northeast, Southeast, Midwest, Southwest, Great Plains, Northwest, Alaska, and Hawaii. However, we went even deeper than the NCA, conducting analysis down to the county level in some cases, and also focusing on key economic sectors. We overlaid our regional climate impact findings with an economic analysis showing the potential cost of these impacts within those regions and sectors. Below, we explore the most striking ndings from each region. We encourage readers to go to riskybusiness.org to explore these regional impacts in more depth and to climateprospectus.rhg.com for the independent research team’s complete risk assessment. In a country as large and diverse as the U.S., it does not make sense to aggregate the highly localized economic impacts of climate change into one headline number. Take the case of Hurricane Katrina: In the last quarter of 2005, every state in the nation prospered except the state of Louisiana, which lost 1.6% of Gross State Product (GSP) as businesses were shuttered and workers stayed home;11 meanwhile the following year, storm recovery activities in Louisiana (e.g., construction) actually increased the national Gross Domestic Product (GDP) by half a percent.12 Indeed, most economic successes and disasters in the U.S. happen at the individual metropolitan, state, and occasionally multi-state level. Regions also have a cultural dimension: Americans often think of themselves as “belonging” to specific regions, according to Joel Garreau’s famous 1981 book The Nine Nations of North America. Garreau posits that Americans live in nine completely different cultural and economic zones. He writes: “Each has a peculiar economy; each commands a certain emotional allegiance from its citizens. These nations look different, feel different, and sound different from each other, and few of their boundaries match the political lines drawn on current maps.”13 Garreau’s observations underscore the fact that as mobile as many Americans are, we’re still often unwilling or unable to move out of our home regions simply because of weather or economic changes. The regional nature of climate impacts and the regional nature of the overall American economy and cultural identity mean that there may not be one single national response to the risks highlighted by the Risky Business Project. But the reality of these impacts, especially in the Southwest and Southeast—which will likely experience the most extreme heat and sea level rise over this century—may also mean that Americans have no choice but to migrate to cooler and more livable areas, disrupting lives, livelihoods, and regional identities formed over generations. While the Northeast region of the U.S. is expected to experience a sizeable increase in temperatures and average number of extremely hot days over the course of the century, the region’s major climate impact will be sea level rise and its effect on coastal infrastructure. Rising sea levels are a direct consequence of rising temperatures: As the oceans warm, they expand. This phenomenon is further exacerbated by land-ice melt, particularly the Antarctic and Greenland ice sheets. Scientists have recently found evidence of accelerating and perhaps unstoppable land ice melt in West Antarctica.14 A further (and more minor) contributor to sea level rise is groundwater withdrawal, which can literally sink the land adjacent to the ocean. All of these factors—thermal expansion, ice melt, and groundwater withdrawal—can lead to higher water levels along the coasts. Why do sea levels matter to the American economy? First and foremost, sea level rise threatens the communities and industries along our coastlines. 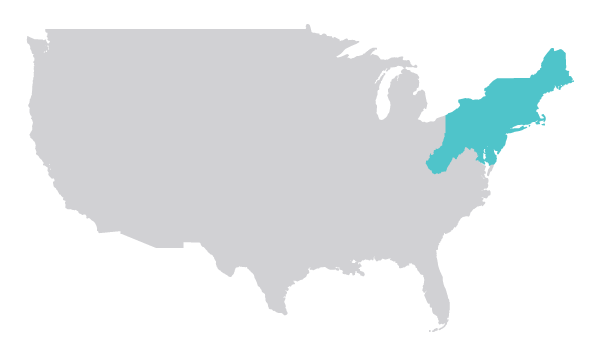 The coasts are critical to the Northeast region’s economy: Its major cities are on the water, as are many of its major industries, from New York’s Wall Street to the fisheries in Portland, Maine. All told, 88% of the population of this region lives in coastal counties, and 68% of the region’s Gross Domestic Product (GDP) is generated in those counties. As a result, much of the region’s residential, commercial, and energy infrastructure is also at or near sea level, making these assets particularly vulnerable to climate impacts. The Risky Business analysis shows that if we continue on our current path, sea levels at New York City will likely rise by an additional 0.9 feet to 1.6 feet by mid-century, and between 2.1 feet and 4.2 feet by the end of the century. 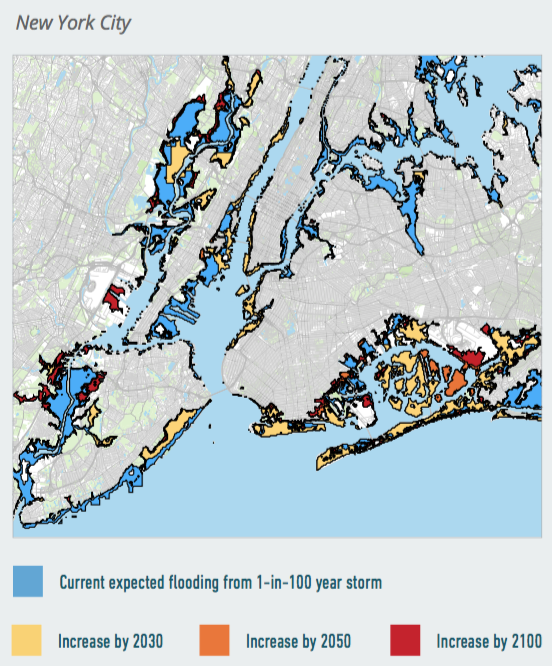 Because our risk assessment includes less likely but higher-impact possibilities, we also found a 1-in-100 chance that New York City could experience more than 6.9 feet of sea level rise by the end of the century. The story for New Jersey is even more concerning because of that state’s groundwater withdrawal: It’s likely that, on our current path, Atlantic City will see 2.4 feet to 4.5 feet of sea level rise by end of this century. North of New York City, the rise is slightly smaller: Boston will likely experience 2 feet to 4 feet by 2100, and Portland is likely to experience a rise of 1.7 feet to 3.8 feet in the same period. Just looking at the simple rise in sea levels masks the impact these higher levels can have during a major storm. Sea level rise that had already occurred over the past century exacerbated storm surge during Hurricane Sandy, expanding the reach of the storm-related flooding and making the storm more costly. Our research shows that, if we continue on our current path, additional projected sea level rise will likely increase average annual property losses from hurricanes and other coastal storms by $6 billion to $11 billion over the course of the century. Potential changes in hurricane activity, also caused by atmospheric warming, would raise these estimates to $11 billion to $22 billion— a 2-to-4-fold increase from current levels. 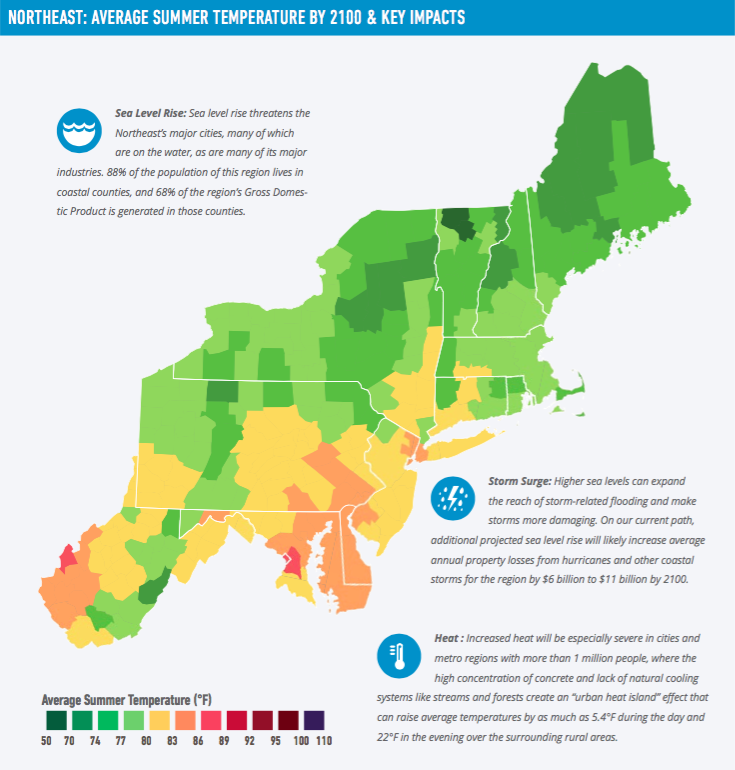 Right now, the Northeast is actually rather temperate in the summer, with only 2.6 days over 95°F on average each year—a temperature we refer to throughout our research as “extremely hot.” By mid-century, the average resident in the Northeast will likely see between 4.7 and 16 additional extremely hot days; by late century this range will likely jump to between 15 and 57 additional extremely hot days, or up to two additional months of extreme heat. 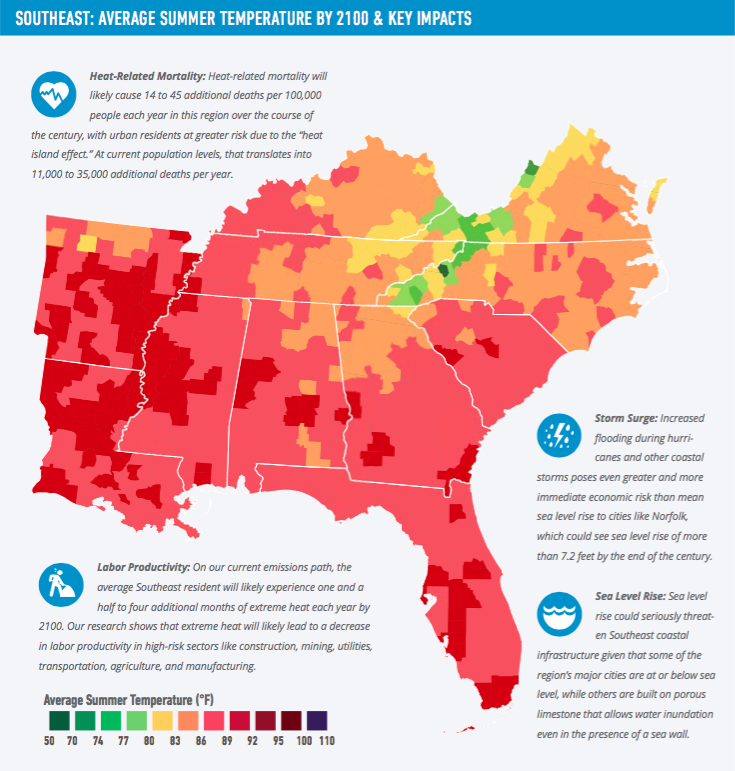 As we discuss further in the Southeast section below, these increasingly hot summers will have serious negative effects on health, mortality, and labor productivity. Like the Northeast, the Southeastern U.S. has many coastal communities, though in this region only 36% of residents live in coastal counties, with 33% of GDP coming from those counties. However, sea level rise could seriously threaten the Southeast’s coastal infrastructure, given that some of the regions major cities (e.g., New Orleans) are at or below sea level while others (e.g., Miami) are built on porous limestone that allows water inundation even in the presence of a sea wall. Much of the region’s critical infrastructure—including roads, rails, ports, airports, and oil and gas facilities—also sits at low elevations. Our research shows a significant risk to this region from sea level rise. 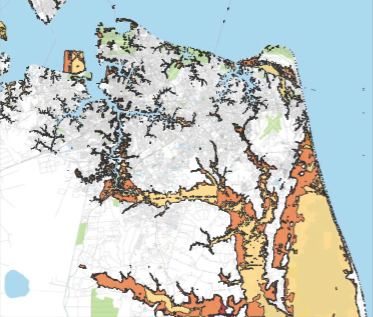 On our current path, by mid-century, mean sea level at Norfolk, Virginia—home to the nation’s largest naval base—will likely rise between 1.1 feet and 1.7 feet, and will rise 2.5 feet to 4.4 feet by the end of century. However, there is a 1-in-100 chance that Norfolk could see sea level rise of more than 7.2 feet by the end of the century (Figure 7). In Florida, because of the porous limestone on which the major southern cities are built, even modest sea level rise comes at a significant economic cost. Under current projections, between $15 billion and $23 billion of existing property will likely be underwater by 2050, a number that grows to between $53 billion and $208 billion by the end of the century. There is a 1-in-20 chance that more than $346 billion in current Florida property will be underwater by the end of this century, and a 1-in-100 chance that more than $682 billion in property will be below mean sea levels. An additional $243 billion in property will likely be at risk during high tide that is not at risk today. As in the Northeast, greater flooding during hurricanes and other coastal storms, plus potential changes in hurricane activity, pose even greater and more immediate economic risks than mean sea level rise. The Southeast will also likely be hit hardest by heat impacts. Over the past 30 years, the average resident of this region has experienced about 9 days per year at 95°F or above. Looking forward, if we continue on our current emissions path, the average Southeast resident will likely experience an additional 17 to 53 extremely hot days per year by mid-century and an additional 47 to 115 days per year by the end of the century. That’s one and a half to four additional months of extreme heat each year. This kind of weather could have serious economic impacts: Our research shows a decrease in labor productivity in high-risk sectors like construction, mining, utilities, transportation, agriculture and manufacturing of up to 3.1% by the end of the century in this region, and a smaller but still noticeable impact on labor productivity in low-risk sectors like retail trade and professional services. We are also likely to see an additional 14 to 45 deaths per 100,000 people every year in this region over the course of the century due to increases in heat-related mortality, with urban residents at greater risk due to the heat island effect. At the current population of the Southeast, that translates into 11,000 to 35,000 additional deaths per year. The upper Midwest economy is dominated by commodity agriculture, with some of the most intensive corn, soybean, and wheat growing in the world. Overall, the agricultural industry in this region includes more than 520,000 farms valued at $135.6 billion per year as of 2012, and the region accounts for 65% of national production of corn and soybeans alone.18 For the Midwest, commodity agriculture is a crucial business, and the health and productivity of the agricultural sector is inextricably intertwined with climate conditions. 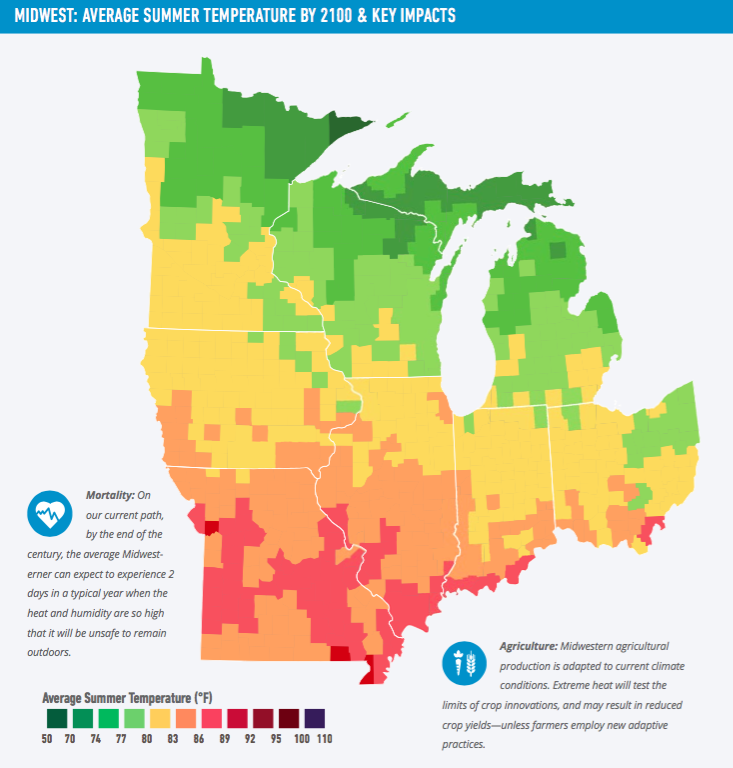 Our research shows that under the “business as usual” scenario and assuming no significant adaptation by farmers, some states in the region, like Missouri and Illinois, face up to a 15% likely average yield loss in the next 5 to 25 years, and up to a 73% likely average yield loss by the end of the century. Assuming no adaptation, the region as a whole faces likely yield declines of up to 19% by mid-century and 63% by the end of the century. Yet while the agricultural industry will clearly be affected by climate change, it is also probably the best equipped to manage these risks. Farmers have always adapted to changing weather and climate conditions, with adaptation and flexibility built into their business models. Armed with the right information, Midwest farmers can, and will, mitigate some of these impacts through double- and triple-cropping, seed modification, crop switching and other adaptive practices. In many cases, crop production will likely shift from the Midwest to the Upper Great Plains, Northwest, and Canada, helping to keep the U.S. and global food system well supplied. However, this shift could put individual Midwest farmers and farm communities at risk if production moves to cooler climates. The projected increase in Midwest surface air temperatures won’t just affect the health of the region’s crops; it will also put the region’s residents at risk. Over the past 40 years, the Midwest experienced only 2.7 days on average over 95°F. If we stay on our current climate path, the average Midwest resident will likely experience an additional 7 to 26 days above 95°F each year by mid-century, and 20 to 75 additional extreme-heat days—potentially more than 2 additional months per year of extreme heat—by the end of the century. On the other hand, the region will also experience fewer winter days with temperatures below freezing. Figure 9. Humid Heat Stroke Index. Data Source: Rhodium Group. But the real story in this region is the combined impact of heat and humidity, which we measure using the Humid Heat Stroke Index, or HHSI. The human body’s capacity to cool down in the hottest weather depends on our ability to sweat, and to have that sweat evaporate on our skin. Sweat keeps the skin temperature below 95°F, which is required for our core temperature to stay around 98.6°F. But if the outside temperature is a combination of very hot and very humid—if it reaches a HHSI of about 95°F—our sweat cannot evaporate, and our core body temperature can rise until we actually collapse from heat stroke. Even at an HHSI of 92°F, core body temperatures can get close to 104°F, which is the body’s absolute limit. To date, the U.S. has never experienced heat-plus-humidity at this scale. The closest this country has come was in 1995 in Appleton, Wisconsin, when the HHSI hit 92°F. (At the time, the outside temperature was 101°F and the dew point was 90°F.) The only place in the world that has ever reached the unbearable HHSI of 95°F was Dhahran, Saudi Arabia, in 2003 (outside temperature of 108°F, dew point of 95°F). 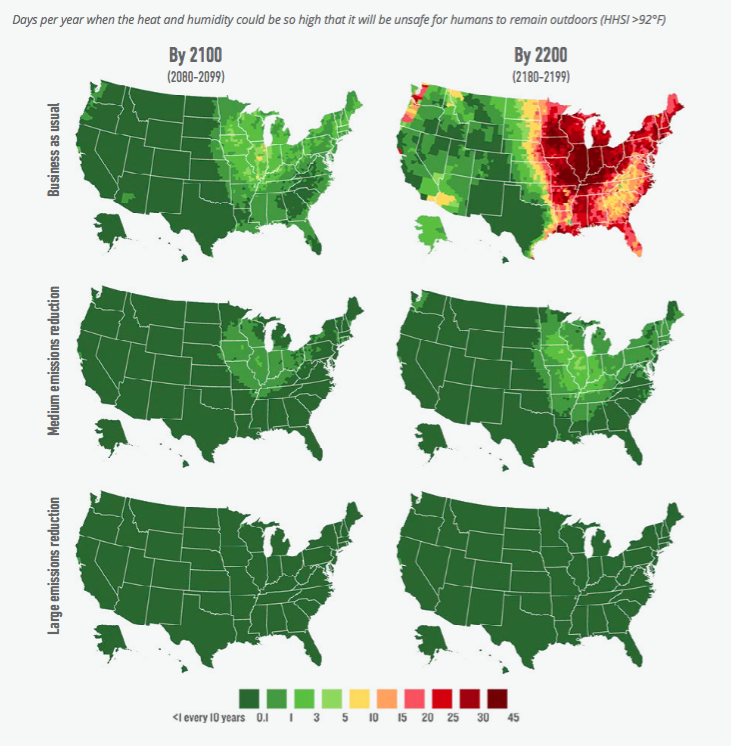 Our research shows that if we continue on our current path, the average Midwesterner could see an HHSI at the dangerous level of 95°F two days every year by late century, and that by the middle of the next century, she or he can expect to experience 20 full days in a typical year of HHSI over 95°F, during which it will be functionally impossible to be outdoors. The Great Plains region stretches from the far north (Montana) to the far South (Texas). Climate impacts will be felt very differently in the northern and southern parts of this region. In the southern states of the Great Plains region (Texas, Oklahoma, and Kansas), our research shows an increase in extremely hot days. The average resident of these states experienced 35 days per year over 95°F in the past 30 years. This number will likely increase by 26 to 56 additional extremely hot days by mid-century and 56 to 108 days per year by the end of the century—for a total of between three and four months of additional extreme hot days per year. At the same time, the northern parts of the region will likely see a significant decrease in extremely cold days: from the average of 159 days per year of below-freezing weather over the past 30 years, to between 117 and 143 freezing days at mid-century, and between 79 and 122 freezing days by the end of the century. The southern and coastal parts of this region will also experience the sea level rise impacts on coastal communities that we’ve already discussed. In Texas, where about one-third of the state’s GDP is generated in coastal counties, sea levels at Galveston, for instance, will likely rise by 1.5 to 2 feet by mid-century and 3.2 to 4.9 feet by the end of the century, with a 1-in-100 chance of more than a 7.6-foot rise. Though the north and south sub-regions of the Great Plains have starkly different climates, all the states in this region rely on two important climate-sensitive industries: agriculture and energy. If we stay on our current path, our research shows a significant increase in demand for air conditioning over the course of the century which, when combined with other heat-related impacts such as reductions in power generation and in transmission efficiency and reliability, could place a considerable burden on the electricity power sector. As soon as 5 to 25 years from now, our research shows a 0.7% to 2.2% likely increase in nationwide electricity consumption. The country will likely see a roughly corresponding decline in demand for heating, as temperatures warm up in the northern states, but the switch from natural gas and fuel oil-driven heating demand to electricity powered cooling demand has significant implications for the U.S. energy system. The largest increases in electricity consumption occur in the Great Plains region, with likely electricity demand growth in Texas and Oklahoma of up to 5% and 6% respectively over the next 5 to 25 years. 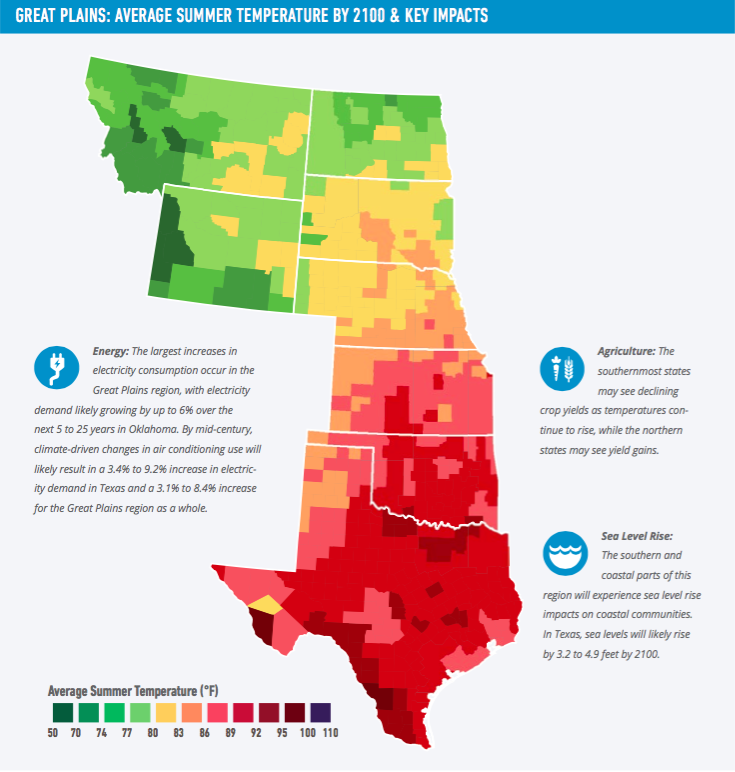 By mid-century, climate-driven changes in air conditioning will likely result in a 3.4% to 9.2% increase in electricity demand in Texas and a 3.1% to 8.4% increase for the Great Plains region as a whole. Figure 10. Change in Electricity Demand and Energy Costs by Region, Mid-Century (2040-2059). Data Source: Rhodium Group. Most of this increase will occur during times of the day when electricity consumption is already high. Meeting higher peak demand will likely require the construction of up to 95 GW of additional power generation capacity over the next 5 to 25 years, the rough equivalent of 200 average-size coal or natural gas power plants. Constructing these new power-generation facilities will, in turn, raise residential and commercial energy prices. Our research concludes that climate-driven changes in heating and cooling will likely increase annual residential and commercial energy costs nationally by $408 million to $12 billion over the next 5 to 25 years and $8.5 billion to $30 billion by the middle of the century. All of this could have a significant impact on the economy of the Great Plains. In addition, many of the region’s current energy-production facilities—from power plants to oil and gas platforms—are at risk from climate-driven increases in storm surge and potential changes in hurricane activity. If these facilities are flooded, the region will lose electricity and energy resources just as the country’s need for them is growing. The Pacific Northwest is a good example of the general truth that similar climate impacts may be felt differently from one region to another. 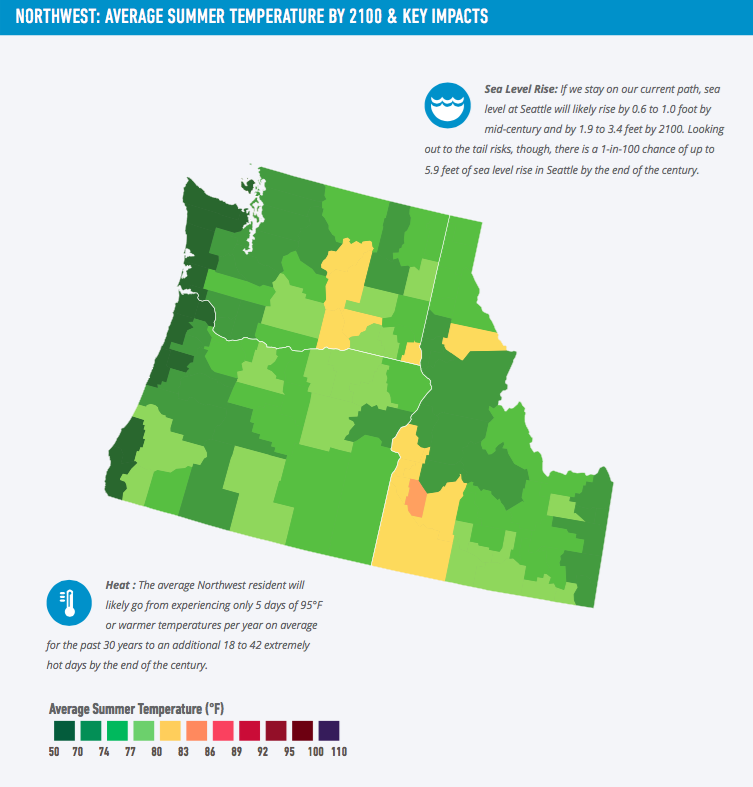 For example, by mid-century this area will have fewer additional extremely hot days than, say, the Southeast—but the average Northwest resident will likely go from experiencing only 5 days of 95°F or warmer temperatures per year on average for the past 30 years to an additional 7 to 15 extremely hot days by mid-century, and to an additional 18 to 42 extremely hot days by the end of the century. This represents an increase of 3 to 8 times the number of hot days for the region per year, which is a significant change from historic norms. This region is also coastal, but the extent of expected sea level rise here is more varied than the east coast. Because the area is relatively close to the Alaskan glaciers, the Earth’s gravitational field may lead to the ice melt in Alaska actually lowering sea levels off Washington and Oregon. At the same time, West Antarctic melt may lead to higher sea level rise in the Northwest over the long term. This latter effect is captured in our analysis of the “tail risk” of sea level rise in the Northwest. Overall, our research shows that if we stay on our current path, sea level at Seattle will likely rise by 0.6 to 1.0 foot between 2000 and 2050 and by 1.6 to 3.0 feet between 2000 and 2100. Looking out to the tail risks, though, there is a 1-in-100 chance of more than 5.9 feet of sea level rise by 2100 in Seattle. The economy of the Northwest is dependent on its coastlines, but it is also heavily dependent on its forests. Oregon and Washington are the number one and two softwood-producing states in the nation, respectively;20 these two states plus Idaho produce more than $11 billion in primary wood product sales.21 Our review of existing research suggests the Northwest’s forests will experience significant potential impacts from climate change, in particular from wildfire—due to both increased drought and to wood damage from pests surviving warmer winters. One study we reviewed found that if temperatures rise 3.2°F by mid-century, this could lead to 54% increase in the annual area burned in the western U.S.22 The same study found that the forests of the Pacific Northwest and Rocky Mountains will likely experience the greatest increases in annual burn area (78% and 175%, respectively). The Southwest region includes the traditional Southwest states—Arizona, Colorado, Nevada, New Mexico, Utah—and also California. As such, it is an extremely diverse region that in some ways serves as a microcosm of all the climate impacts we’ve discussed so far. This region is already warm and dry—about 40% of this area is covered by desert23—and is likely to become more so in the coming decades. Over the past 30 years, the average Southwest resident experienced 40 days per year of temperatures of 95°F or more. If we con- tinue on our current path, by mid-century the average Southwest resident will likely see 13 to 28 additional extremely hot days. By the end of the century, this number will likely rise to an additional 33 to 70 days of extreme heat due to climate change. That translates to one to two additional months of days over 95°F each year within the lifetime of babies being born right now in this region—one of the fastest-growing in the United States. Because it includes California, the Southwest is not just one big desert; it is also an extremely coastal region. Eighty-seven percent of all Californians live in coastal counties, and 80% of the state’s GDP is derived from those counties. Along the coastline of San Diego, if we continue on our current path, sea level will likely rise by 0.7 to 1.2 feet before the middle of the century, and by 1.9 to 3.4 feet by the end of the century. But the real sea level risk in this region is in the tails. The California coastline is more exposed to sea level rise resulting from Antarctic melt than the global average, and there is a 1-in-100 chance that sea levels could rise by more than 6.3 feet by 2100 in San Diego. In part because of tectonic plate activity in California, sea level rise will vary across the state: Los Angeles (1.5 to 3.0 feet by 2100), Santa Monica (1.7 to 3.1 feet by 2100), and San Francisco (1.8 to 3.2 feet by 2100) will likely see lower rise than San Diego. While extreme heat days in the Midwest and Southeast will likely be coupled with high humidity, here in the Southwest the days will likely be hot and dry, increasing the potential of wild res and drying up water sources. While we did not quantify the impact of climate change on either forestry or water availability, these are significant climate risks in the Southwest region, and both are ripe for further analysis. As the Southwest climate heats up, the region is likely to see significantly less snow in the mountains, leading to decreases in spring runoff especially in California and the Southern Rockies. Extreme heat may also lead to higher evaporation of existing reservoirs. This translates into less available groundwater for critical industries such as agriculture, as well as for simple drinking and bathing. Even as temperatures rise, increased energy demand from air conditioning will likely lead to increased water demand, since electricity generation is heavily water-dependent. Decreased water availability is also likely to be the most significant impact on this region’s agricultural industries, which tend to be non-commodity crops (tree nuts, fruits, etc.) and therefore are not included in our quantitative analysis of the agricultural sector. Alaska is ground zero for U.S. climate impacts. The state relies heavily on three climate-sensitive commodities: oil and gas, minerals, and seafood. More than 80% of the state’s GDP comes from oil and gas production, and so increases in energy demand (as discussed above) will dramatically affect this region. Meanwhile, fisheries and tourism, the third and fourth largest contributors to the Alaska economy, depend on healthy oceans and coastal ecosystems. Our research shows major climactic changes in Alaska over this century. If we continue on our current path, by mid-century Alaska’s average temperature will likely rise to between 3.9°F to 8.0°F warmer than it has been over the past forty years. By the end of the century, temperatures will likely rise by 7.6°F to 16°F, but there is a 1-in-20 chance that they will rise even higher, by as much as 19°F. The bulk of this warming is likely to happen in the winter months, significantly decreasing the number of extremely cold days that Alaska now experiences. Up until 2010, Alaska experienced about 188 days per year below freezing; our current path will likely decrease these freezing days by 14% to 25% by mid-century, and by 30% to 50% by the end of this century. 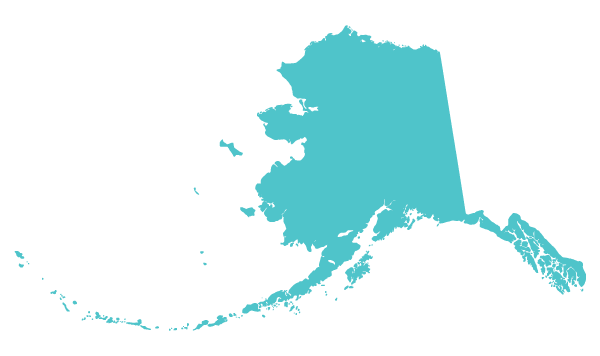 The state is heavily coastal: 84% of Alaskans live in coastal counties, and 86% of the state’s GDP comes from these counties. Sea level is variable around the state, due to the proximity of the glaciers and to shifting tectonic plates. As in the Pacific Northwest, the state may actually see sea levels go down over the course of this century: Our research shows that sea level at Juneau will likely fall by 1.6 to 1.9 feet between 2000 and 2050 and by 2.4 to 3.5 feet between 2000 and 2100. On the other hand, Anchorage will likely experience between a 0.6 feet sea level fall and a 1.2 feet sea level rise by the end of the century, with a 1-in-100 chance of more than a 4.0 foot rise. Prudhoe Bay is likely to experience 2.3 feet to 4.5 feet of sea level rise by 2100, with a 1-in-100 chance of more than a 6.6 foot rise. As Alaska is at the center of climate impacts from melting ice, Hawaii is at the center of impacts from sea level rise. This state is 100% coastal in both its population and GDP. Hawaii is expected to get significantly warmer: On our current path, by mid-century average temperatures will likely be between 1.6°F to 3.6°F warmer than temperatures over the past 40 years. By the end of the century, temperatures will likely increase between 3.7 and 7.7°F. There is also a small but not insignificant chance that Hawaii’s average temperatures could rise as much as 9.4°F by the end of the century. Sea level rise in Hawaii is greater than the global average, and the extreme dependence of this state on the coasts will only intensify this impact. If we continue on our current path, sea level rise at Honolulu is likely 0.8 inches to 1.2 feet greater by mid-century, and 2.1 to 3.8 feet by the end of the century. Looking out at the 1-in-100 tail risk, sea level at Honolulu could rise by more than 6.9 feet by 2100. 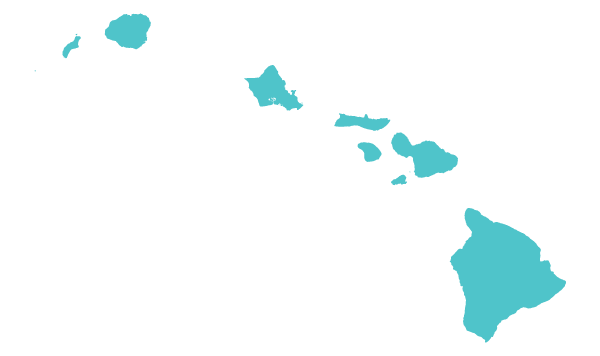 Hawaii cannot reasonably be looked at as a stand-alone region, however: This state imports the vast majority of its food and energy, and is interdependent with the rest of the U. S. as well as the rest of the world. The recent tsunami in Japan and typhoon in the Philippines have awakened many businesses to the impact of a changing climate on global supply chains,26 and ultra-dependent regions like Hawaii are by necessity very sensitive to these realities. Changing agricultural yields on the mainland may have a significant effect on Hawaii in terms of food cost and availability. Similarly, higher energy costs in the continental U.S. are likely to drive the cost of imported energy even higher for Hawaii. The state is pushing forward to diversify its energy resources and rely more on domestic renewable sources; however, most of these installations are along the vulnerable coastlines. Taking a classic risk assessment approach to climate change in the U.S. leads to the inescapable conclusion that if we continue on our current climate path, the nation faces multiple risks across every region. But risk assessment is not just about identifying risks and leaving it at that. Our research also shows that if we act today to move onto a different path, we can still avoid many of the worst impacts of climate change, particularly those related to extreme heat. We are fully capable of managing climate risk, just as we manage risk in many other areas of our economy and national security—but only if we start to change our business and public policy decisions today. The Risky Business Project was not designed to dictate a single response to climate risk. We know that there will be a diversity of responses to our analysis depending on the particular risk tolerance of individual business and policy actors, as well as their particular region or sector of the economy. But the Risk Committee does believe, based on this project’s independent research and the significance of the climate risks it demonstrates, that it is time for all American business leaders and investors to get in the game and rise to the challenge of addressing climate change. The fact is that just as the investments and economic choices we made over the past several decades have increased our current vulnerability to climate change, so will the choices we make today determine what our nation looks like in 15 years, at mid-century, and by 2100. In short, we have a choice whether we accept the climate risks laid out above or whether we get on another path. This is not a problem for another day. The investments we make today—this week, this month, this year—will determine our economic future. Changing everyday business practices to become more resilient. Some of the climate impacts we analyzed are already being felt across the nation; indeed, some are already an unalterable part of our economic future. Rational business actors must adapt. The agricultural sector is on the front lines of climate adaptation. As Risk Committee member Greg Page has noted, “Farmers are innovators and consummate optimizers. . . . They persistently demonstrate the ability to adapt to changes in the environment and successfully adopt new technologies.”29 In coastal communities, too, private and public sector decision-makers are beginning to adapt to present climate impacts, building sea walls and changing building codes to recognize the reality of rising sea levels and increased storm surge. Incorporating risk assessment into capital expenditures and balance sheets. Instituting policies to mitigate and adapt to climate change. In the Risky Business Project, we focused primarily on modeling our current economic path and the attendant climate risks. Because this is the path we’re now following as a nation, we need to better understand the potential risks it poses and decide how to respond to those risks—especially those that are already embedded in our economy because of decisions we made decades ago. But the path we’re on today does not have to be the path we choose to follow tomorrow. Our analysis also looks at alternate pathways that include investments in adaptation and policy efforts to mitigate climate change through lowering greenhouse gas emissions. These alternate pathways could significantly change the climate impacts we discuss above. For example, modest global emission reductions can avoid up to 80% of projected economic costs resulting from increased heat-related mortality and energy demand. Our goal in this risk assessment is not to dictate those policy pathways. However, we do strongly urge the American business community to play an active role in the public discussion around climate mitigation and preparedness, which we believe is the single most effective way for businesses to decrease the risks we have identified in this project. With this project, we have attempted to provide a common language for how to think about climate risk— built upon a common language of risk that is already part of every serious business and investment decision we make today. If we have a common, serious, non-partisan language describing the risks our nation may face from climate change, we can use it as the springboard for a serious, non-partisan discussion of the potential actions we can take to reduce those risks. When Risk Committee member George Shultz was serving as President Reagan’s Secretary of State in 1987, he urged the President to take action on that decade’s hotly-contested scientific issue: the ozone layer. As Shultz later said in an interview with Scientific American, “Rather than go and confront the people who were doubting it and have a big argument with them, we’d say to them: Look, there must be, in the back of your mind, at least a little doubt. You might be wrong, so let’s all get together on an insurance policy.”35 That insurance policy became the Montreal Protocol on Substances that Deplete the Ozone Layer, an international treaty still in effect to this day. Our goal with the Risky Business Project is not to confront the doubters. Rather, it is to bring American business and government—doubters and believers alike—together to look squarely at the potential risks posed by climate change, and to consider whether it’s time to take out an insurance policy of our own.